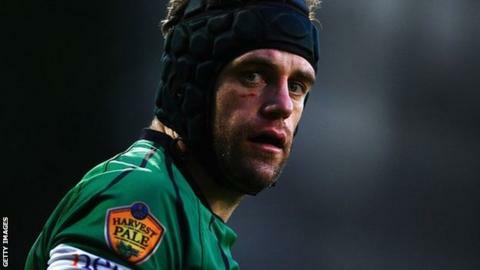 Nottingham's David Jackson has been forced to retire with immediate effect after 13 years with his hometown club. The 31-year-old has taken the decision on medical grounds after suffering a head injury in pre-season training. Winger Jackson has been with the club from the age of six, going on to score 102 tries in 316 appearances. "I've been on the journey from National League Two to challenging for the Premiership and I feel very lucky," he told BBC Sport. "Of course it would have been nicer to make the retirement decision yourself, rather than it being forced upon you, but it's been great to represent a club in the city I grew up, which means so much to me. "I'd like to thank the fans who have given me such fantastic support down the years. I am going to miss running out in front of them and interacting with them." Jackson sustained the injury on August 16, which had sidelined him for the duration of the 2013-14 so far. He has been disappointed to be sidelined, with the Green and Whites struggling at the wrong end of the Championship table. In one game against Jersey in October, Nottingham struggled to field a side in a 22-19 defeat by the Channel Islanders. The club have won three and drawn one of their last five matches in all competitions and will next visit Leeds Carnegie on 28 December. Jackson added: "I knew it was quite a bad one when it first happened because I was pretty groggy for a couple of weeks. He has been a tremendous ambassador for the club, on and off the field, who prides himself on the very highest of standards. "I tried to come back a couple of times but it still wasn't right and that's when I started to fear the worst. "I went to see a specialist and had some scans and the medical advice was that I shouldn't play again. You can't go against that kind of advice." Jackson, who lives in Mapperley, has a degree in engineering and has already done some work as a science teacher. He is still weighing up his next move, but would like to stay involved with Nottingham and rugby in some capacity. "I'll be down there for the rest of the season and then we'll see how it goes from there," said Jackson. "At the moment I'm trying to get my head around it, figure out what I want to do next and see what opportunities arise." Nottingham head coach Martin Haag, who has worked with Jackson for 18 months, said: "Jacko's retirement is a big loss to the squad and it's always very disappointing to lose a player of his calibre, particularly prematurely. "He has been a tremendous ambassador for the club, on and off the field, who prides himself on the very highest of standards. "I imagine that he has green and white veins as he's Nottingham through and through. I just hope that his future pans out the way he would like it to. Nobody deserves it more." Nottingham chief executive Simon Beatham, who coached Jackson for eight years added: "I remember him when he was a 17-year-old lad running rings around the first team. "All through our recent history, in all the key games and the key moments, the one person you could absolutely rely on was David Jackson. "